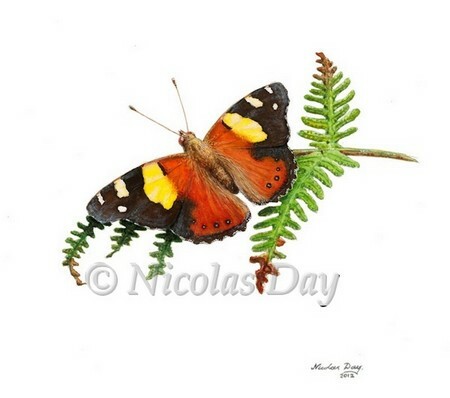 Australian Admiral butterfly print from original painting. The Australian or Yellow Admiral Butterfly is particularly wide spread in south eastern Australia. It behaves much as Admirals do in other parts of the world. They are attracted to many plants, and buddleias are sure to tempt them. If a few nettle patches can be left it is easy to have them as a breeding species in the garden where their jaunty flight and pleasing colour can be frequently admired. Area shown by dotted line is approx. height:10.7cm. 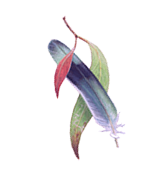 x width:11.5 cm . Butterfly wingspan: 7.5 cm. Printed on an A4 size sheet, it has a generous white border for handling and framing.